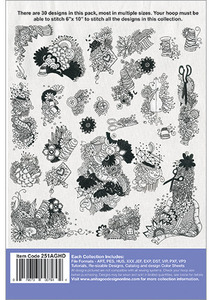 Carol’s Doodles/Full Collection / 30 Designs most in multiple sizes– hoop must be able to stitch 6”x 10” to stitch all the designs in the collection. If you have ever attended one of our Anita’s Embroidery Workshops at one of our participating retailers nationwide you probably noticed the beautiful sewing doodle designs on the newspapers that you receive with each class. Carol Lantis, one of the artists at Anita Goodesign, created those doodles. We have had dozens of requests to digitize those doodles and make them available as a collection. Your wishes came true. Carol created over 30 different doodles for this collection and each of the pieces of art are truly unique. Every time you look at one of these designs you will notice something different. 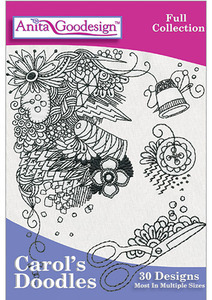 Hidden inside the doodles are scissors, needles and an assortment of other sewing notions. These designs will look wonderful on anything you stitch them on and the best part is that they stitch very quickly since they are all created using only one color of thread and they stitch without stops.